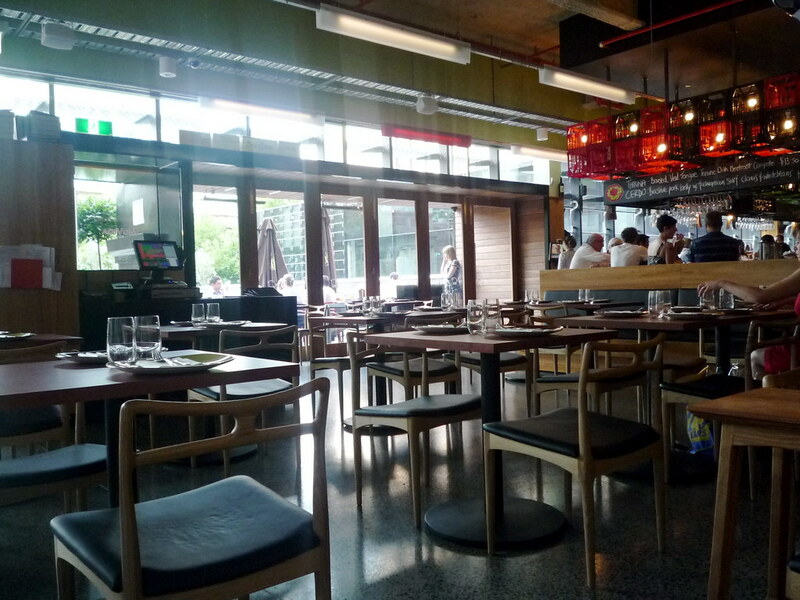 Having enjoyed breakfast at MoVida Terraza last month, it was only going to be a matter of time before I visited its older sibling, MoVida Aqui. One of my fellow Ladies Who Lunch, Miss T, made good her promise and took me and the other girls there for dinner just before she went overseas. Thanks, Miss T! I can see from the search terms being used to find this blog that many people think it's spelled "MoVida Acqui". It's not. It's MoVida Aqui. 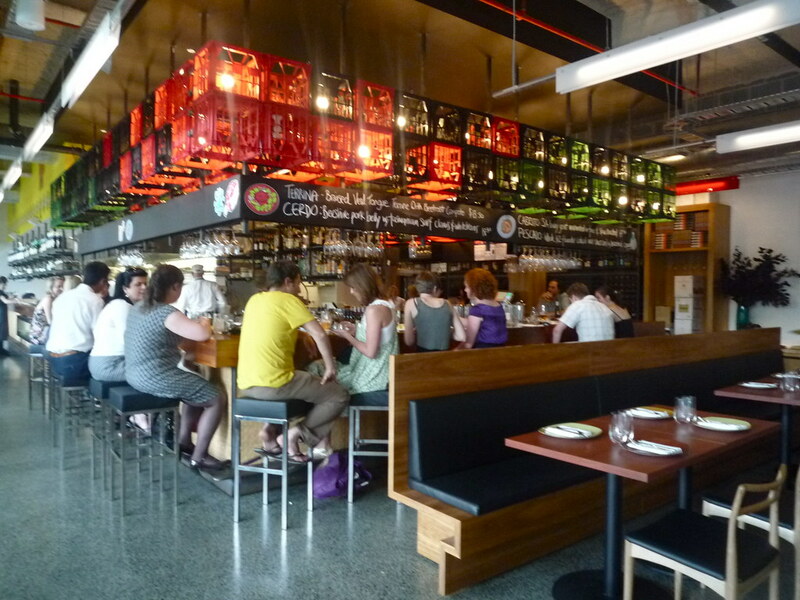 Although the restaurant is more formal than the Terraza kiosk outside, MoVida Aqui's trendy use of plastic milk crates over the kitchen/bar and energy-saving lighting still makes it feel more canteen-like and casual than the original MoVida restaurant. It was a damn hot day when the Ladies and I visited, so several glasses of chilled water and a big jug of white sangria was the perfect way to start us off. Foodwise, we started with anchoas: hand filleted Cantabrian Artisan anchovies on croutons on smoked tomato sorbet ($4.50 each). I'd already tried these at MoVida in October, but couldn't resist ordering them again. That smoked tomato sorbet with the saltiness of the anchovy!! Miss L, who is NOT prone to over-exaggeration, declared it the most delicious anchovy she'd ever had. 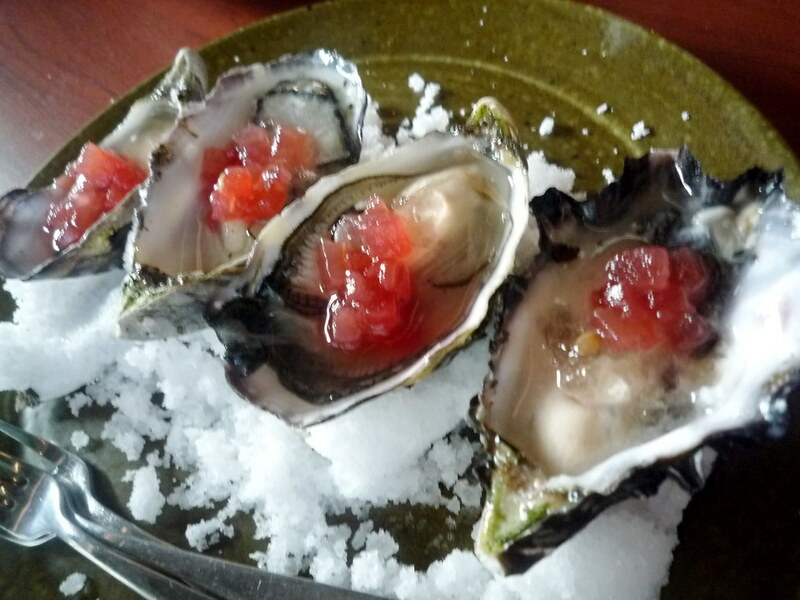 We also ordered an ostra each - they were Coffin Bay oysters shucked to order, served with manzanilla and watermelon dressing ($3.80 each). 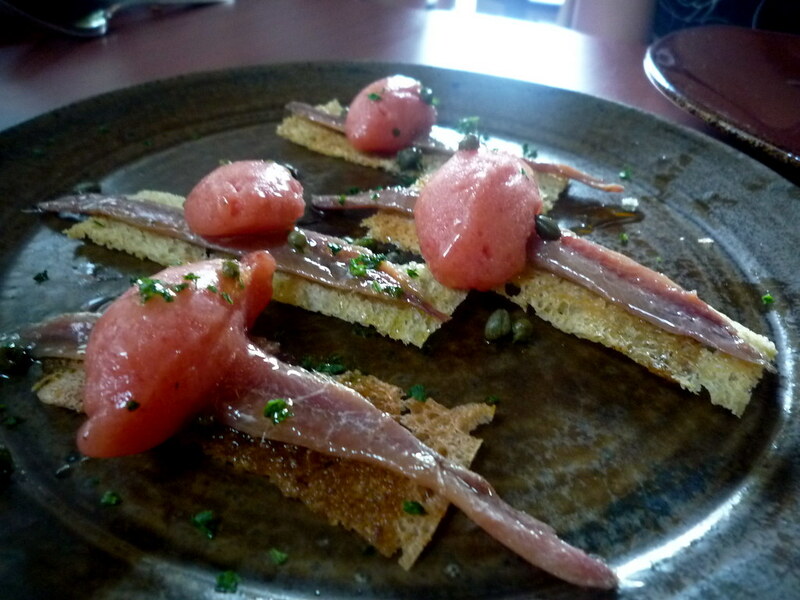 As with the anchoa flavours, the manzanilla and watermelon together was a dazzling combination of flavours. But here we have the tapa that really tipped me over the edge, the bocadillos de calamares ($6.50 each). 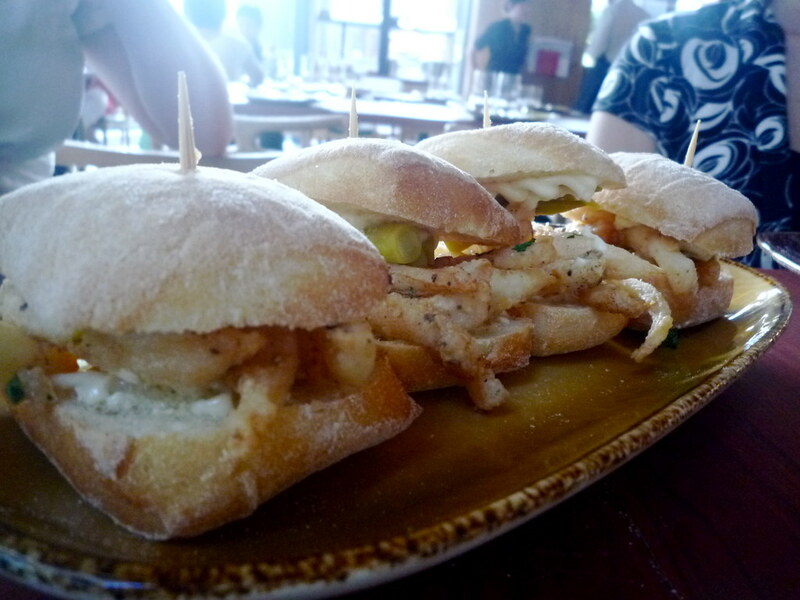 They're petite calamari sandwiches which include Basque guindillas (peppers pickled in white vinegar) and mayonnaise. SO GOOD. 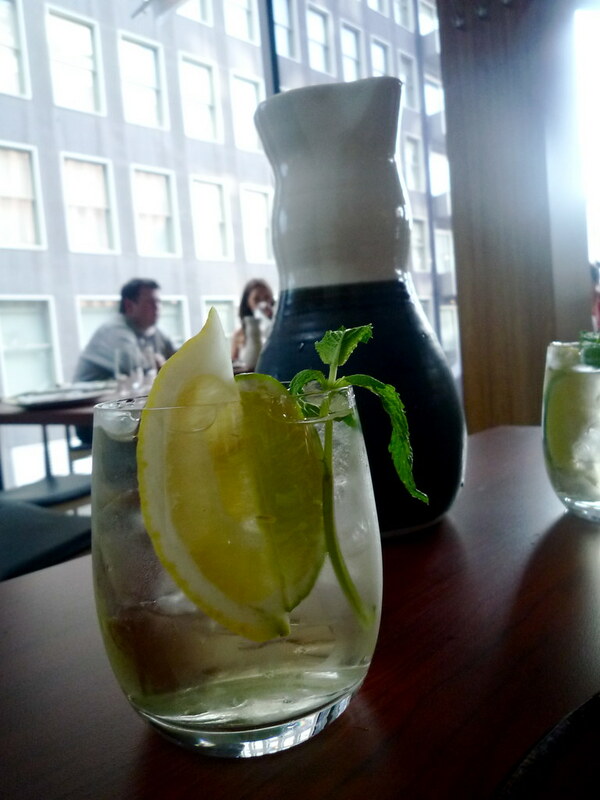 The guindillas were wonderfully piquant and the calamari was tender and full of flavour. I wonder if they'd let you pop in and grab just one of these as an on-the-run snack?? The bocadillo was probably my favourite dish of the night. 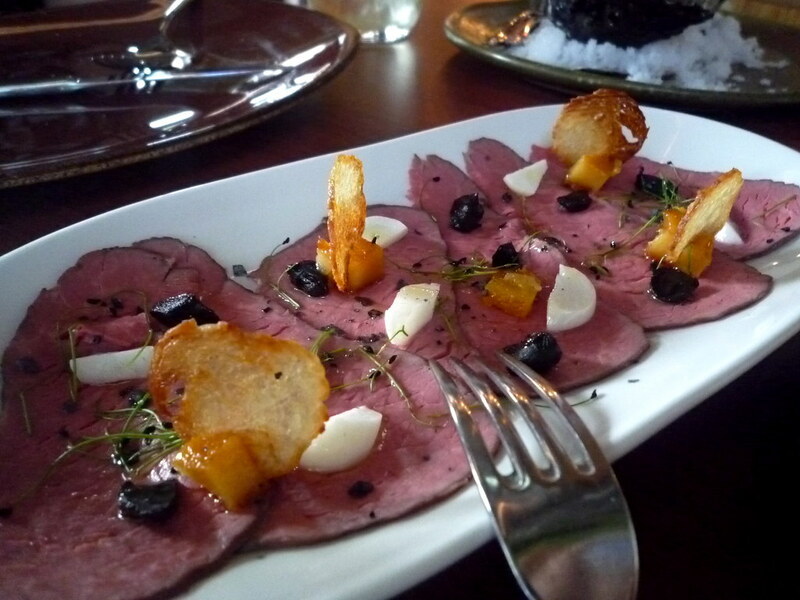 Next up was the buey ($17.50), which consisted of "Rost Biff" wagyu with tocino de cielo (described to us in this instance as "horseradish custard"), crisps, pickled garlic and black fermented garlic. The cubes of horseradish custard were amazing, as was the black and white garlic. 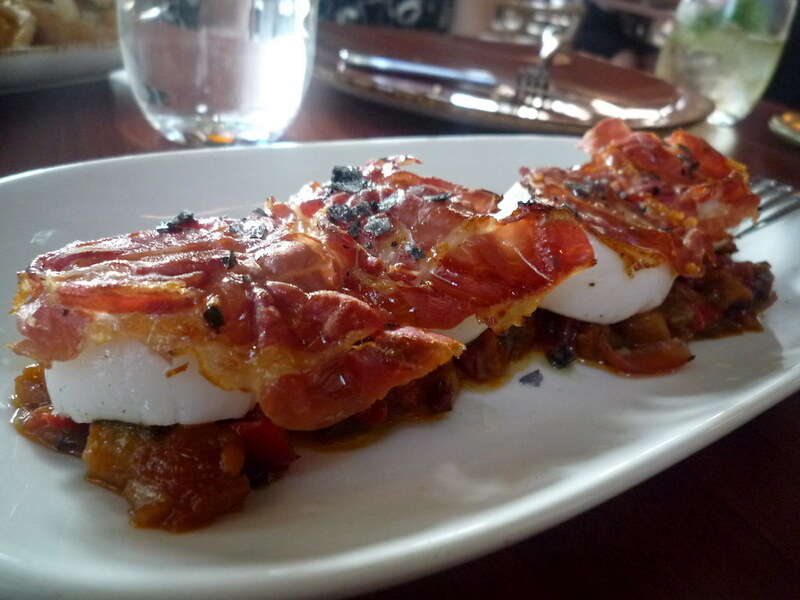 The viera ($16) - scallops grilled with jamon on pisto, braised manchego style vegetables - was probably my least favourite of the dishes, in that I merely LIKED it and didn't LOVE it. I thought the ratatouille-like pisto was just a tad sharp. 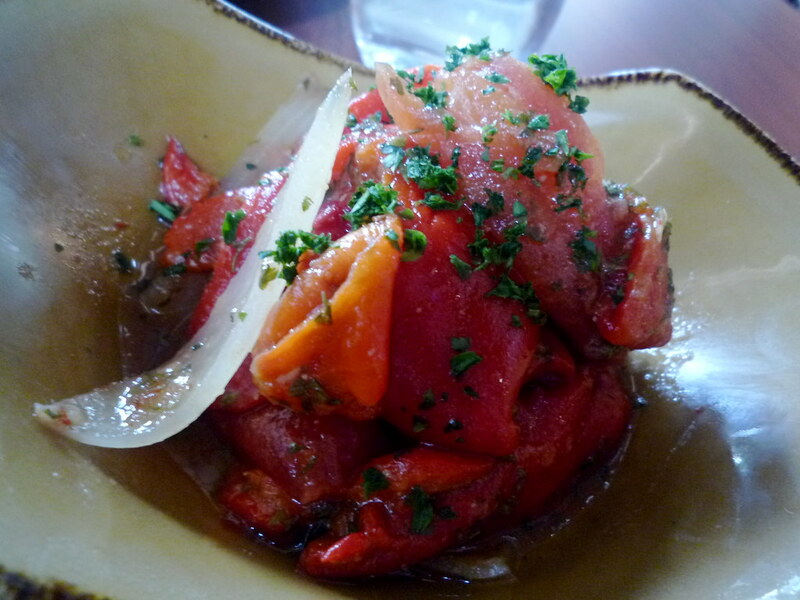 But I really loved the simple asadillo salad we had on the side ($11.50): roasted capsicum and tomato with Andulacian flavours... oil, garlic, capers, parsley. 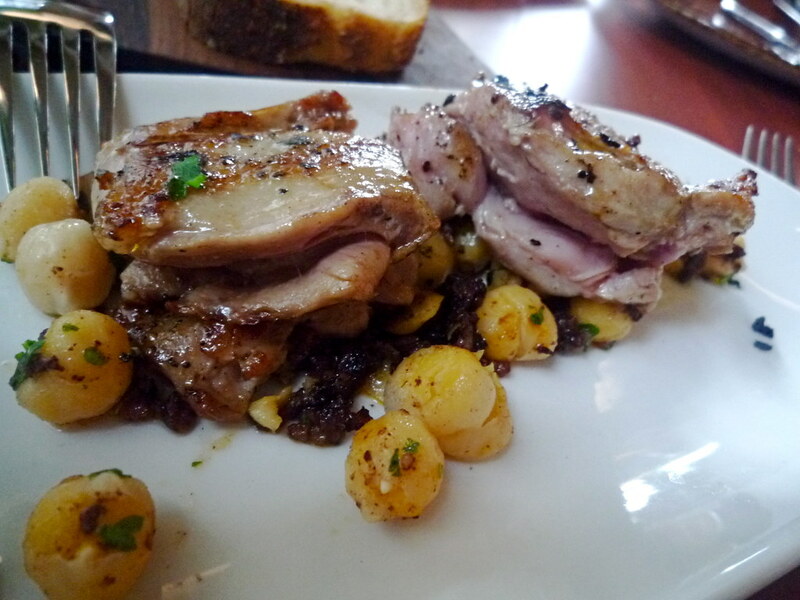 The cordoniz ($16.50) was quail charcoal grilled with housemade morcilla and chickpeas. The housemade morcilla - Spanish blood sausage - was very, very good and I loved its crumbly texture contrasted with that of the chickpeas and the juicy meat. 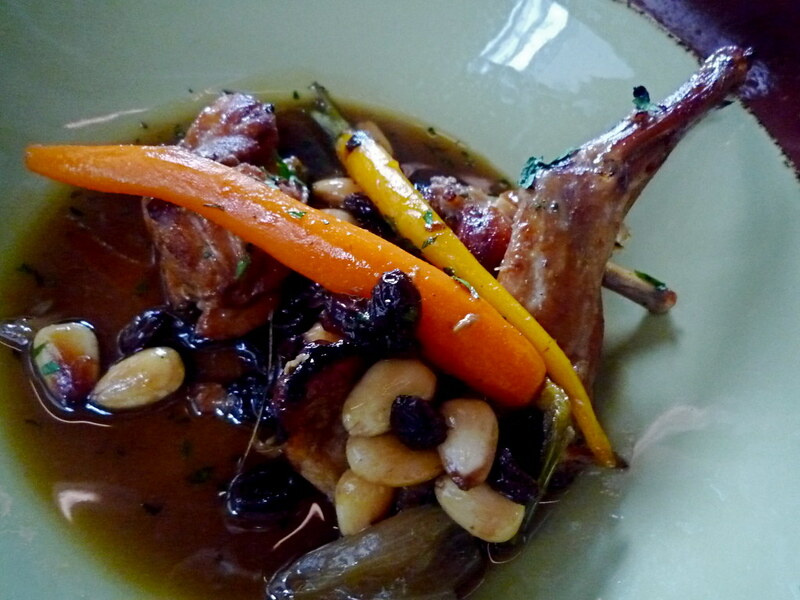 Our final savoury dish was the conejo agridulce ($22), Andalucian braised rabbit leg in a sweet and sour sauce with almonds and raisins. The raisins were nicely swollen with the sauce, whose honeyed aroma swept over us as I took this photo. The braised leg was soft and moist, the almonds were softened and the sauce was just sour enough. Perfect. 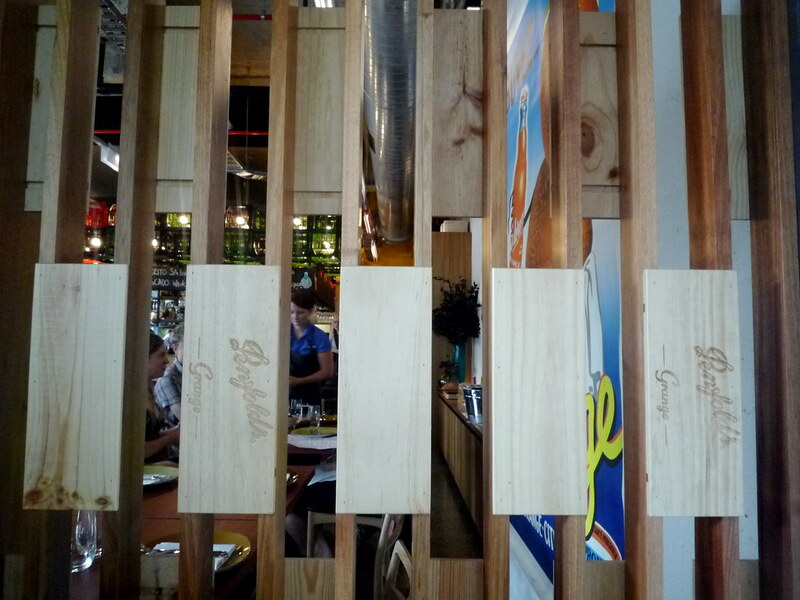 Nice use of wooden panels from cases of Grange! We decided to share a few desserts between the four of us. 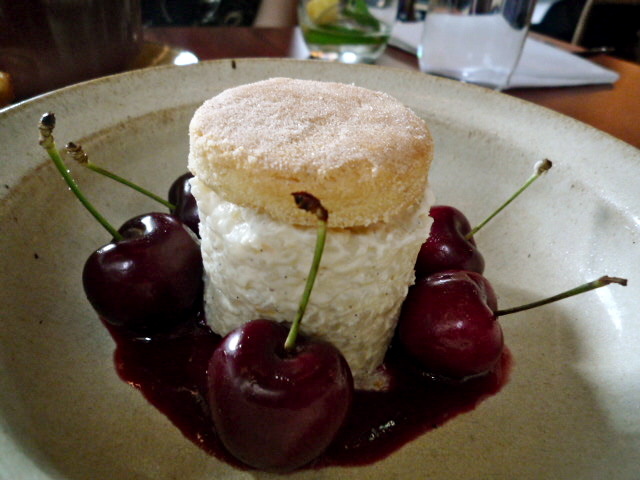 Miss T was keen to try the arroz con leche ($12.50), which was a chilled cylinder of rice pudding sitting on a drizzle of liquor 43 sauce, surrounded by plump fresh cherries and capped with a shortbread-y polvorone biscuit. 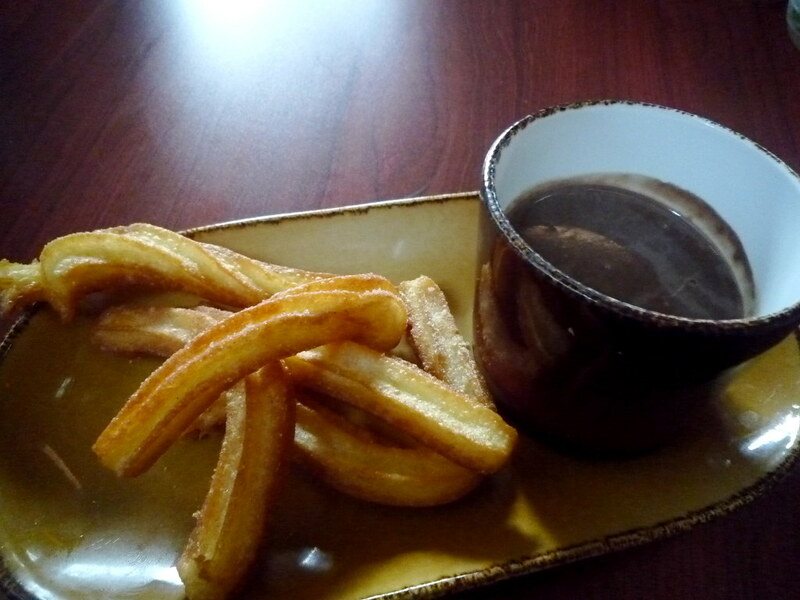 We also couldn't resist ordering some excellent churros con chocolate ($10). How many MoVida's are there? 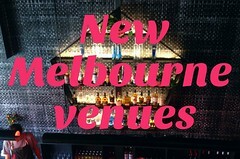 There seems to be a new one every time I come back to Melbourne, however, by the looks of things this is good news. I want very much a little calamari sanga. Now, even though it is 9am. Yum. Yowsers this looks amazing! I've been finding it impossible to get a booking there though...so have to eat vicariously through your pics! 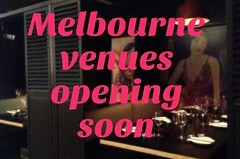 im gonna have a hard time surfing thru the blog to see what i shall eat in my few days in melbourne nxt mth! 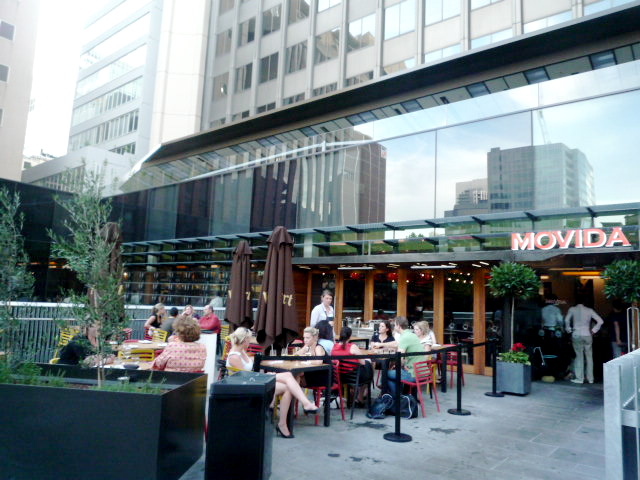 I've always wanted to try dining at a MoVida! My friends live near the one near Russell street so I always walk pass it when I visit. The calmares bocadillos looks so good! Christy, I just love them too. Very keen to go back for more soon! Thanks Joyce! Book in soon. Hey Joe, hope you enjoy your time here in Melbourne. Give it a try Leanne! 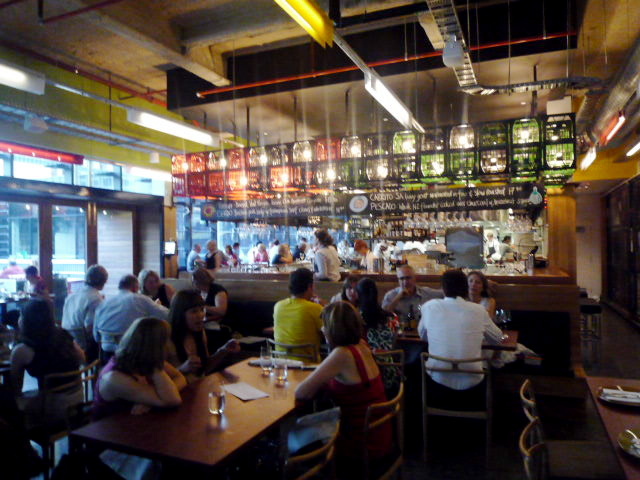 With MoVida Next Door and MoVida Terraza there's no need for bookings. Finally Lady, a Melbourne food blog which is simple, to the point, continuous and not just someone trying to prove their vocabulary skills or show how cultured they are... this is really fresh. ill be following it.